The international community is increasingly worried about the pace of resettling more than 260,000 internally displaced persons (IDPs) from closed camps in Sri Lanka, a senior UN representative warns. "There is a growing concern from the international community that the pace of progress is simply too slow," Walter Kaelin, Representative of the UN Secretary-General on the Human Rights of Internally Displaced Persons, told IRIN. "There is an urgent need to restore the freedom of movement for the displaced. They should be allowed to return to their homes, and where this is not possible, to stay with host families or in open relief centres," he said in a telephone interview from Geneva on 30 September. Kaelin completed a three-day visit to Sri Lanka on 26 September, having met government ministers and officials to discuss the treatment of the IDPs, who are in state-run camps in the north of the country. 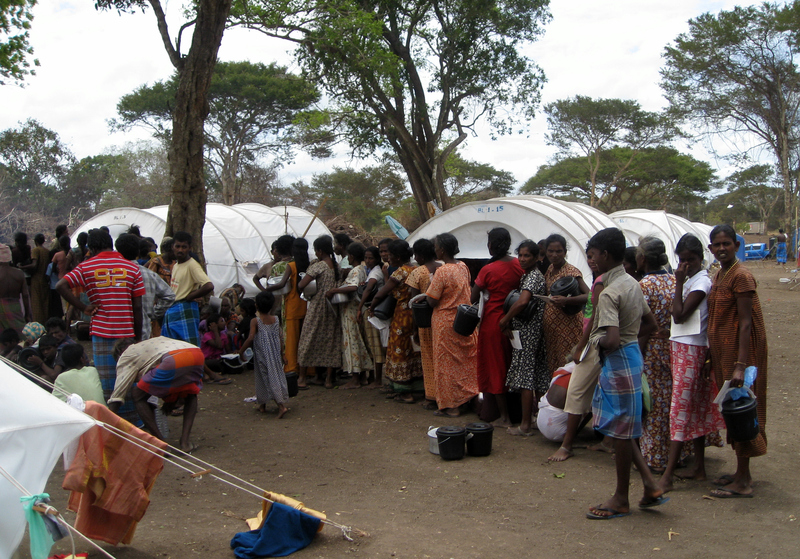 The Sri Lankan government says it is trying to expedite the resettlement of the IDPs, and has set a target of 70 to 80 percent to be released by year-end. It has defended the resettlement pace, saying it must screen the IDPs for rebels from the Liberation Tigers of Tamil Eelam (LTTE), against whom it fought a bitter 26-year war. But the IDPs have been languishing in the congested camps since the end of the war in May without the freedom to leave, and Kaelin said their prolonged internment in the camps - not designed for long-term stays - was a concern. "Certainly people do get food, they do get medical assistance, and there is education in the camps. So from that perspective, the government and international community have done a lot," he said. "Our concern is that the screening process is going too slowly, and we also have concerns about the nature of the screening process." Under international humanitarian law, legitimate security concerns may justify the internment of civilians at the height of a conflict, but not longer than is absolutely necessary. Individuals must also be told why they have not been released. Kaelin said there was a lack of transparency in the screening process, and that people were also not being informed on an individual basis why they were being held. "Unless there is very substantial progress in the very near future with the release of people, concerns about the violation of international humanitarian law will become a serious issue," he said. Top UN officials issued repeated calls this month for the IDPs to be resettled more quickly as worries mount over conditions in the camps ahead of upcoming monsoon rains. UN Secretary-General Ban Ki-moon warned earlier this week in talks with Sri Lankan Prime Minister Ratnasiri Wickremanayake that a failure to rapidly resettle IDPs would lead to growing bitterness. And Kaelin's visit to Sri Lanka followed on the heels of Lynn Pascoe, the UN Under-Secretary-General for Political Affairs, who called on the government to speed up the screening and release of IDPs. "What was positive is that government has agreed that a substantial number of people should be released in the near future. But it remains to be seen to what extent this will be implemented," said Kaelin. The government announced earlier this month it would release IDPs into the custody of their relatives. It has repeatedly said it is committed to resettling the IDPs, but first it has to clear some 1.5 million landmines and unexploded ordnance from former combat areas. It also says there is a lack of adequate housing and infrastructure in those areas to service the IDPs, and that reconstruction must take place first.